instead of sayin "ill be there" im going to say "i want to be there" and "will try to remmebre"
my celica is running, but i have a few things going on for theblue elan which may end up taking up my thusday. as between my 2 neighbors, im gonna get the outriggers welded and the windshield replaced, and if either of them as thursday afternoon free, those tasks are a priority in my list. a5gcd wrote: When and where are you meeting now, I will come along if I can. Good Lord. It's the lesser spotted Geoff. Hope you are well. whos planning to be there thursday ? 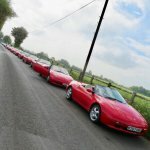 my elan has both head gasket replaced and the interior fitted, although theres a 2 ton trailer with an MR2 in the way to the road..
i havent ran it at all yet, so theres always the possibility fo a clowd of smoke coming up as soon as i drive it down the road... fingers crossed. i can live with the alternator light issue, id call that pretty minor. the engine power is where im not happy. had a word with Dave and he said its likely just a minor adjustment on the CAS will bring it back to its former glory. Yes I will be there. See you all Thursday. change of plans at this end. the elan did get to work fine without issues, but the trip home was not so pleasant. i may have some serious heat problem now, although theres really no way of knowing. I have got some help from dave to know what to look for and already ordered a compression tester from ebay to check for a possible second head gasket failure. So today should be the day, but I see no one has mentioned it. Pete - I hope you read this before you have another lonely evening in the pub!! maz_r wrote: So today should be the day, but I see no one has mentioned it. i was making plans to attend but doesn seem like anyone else is ? coil pack seems to disagree on the Elan. I'm back and in one piece. Intend to be there on Thursday..
so, providing i dont forget i will be there. unfortunately the elan is still decommissioned. the MOT failed with brake issues and a cv joint boot. honestly those are all minor issues (i mean, easy to fix). and its possible i will have it with an MOT by thursday. the issue that makes me 100% sure i wont be driving it is the weird random missfire i documented elsewhere in the forum. which doesnt seem like a "afternoon after work" kind of fix sadly.